I noticed that many, if not most, men with long hair in the 60s and 70s had layered styles. Gram Parsons is a good example of this. But now I rarely see men with long hair wear bangs, they usually keep an even length (which I think looks better). I was a young man in this era in NYC, and I cannot recall one single guy who had bangs. One thing that made the "Brit Invasion" performers seem strange was that they did have bangs, that bizarre Mamie Eisenhower look. The Beatles original look was snickered at if you were not a teenage female. That hairstyle page is pretty good. AFAIC, it only has one style that, in my book, is in error - the surfer look - otherwise its good. I was also there, in that time, and my high school senior photo was with long hair. That was just after the "Summer of Love" and just before Woodstock. So it was still pretty uncommon. Odd as it might sound, I think we regarded single length long hair as a "girl" style. Even though many people regarded OUR long hair as a "girl" style. We didn't often have bangs, though, so much as the hair in front was just cut a bit shorter than the sides and back. And it was typically combed to the side, so you would get some coverage in front, but it wouldn't be in your eyes. To my mind, bangs are the hair cut in front so that they are NOT combed to one side or the other. It sounds like you're describing the shag hairstyle, like David Cassidy wore. Bangs were a big part of that. For women, bangs were a big thing in the 80s, and had died out of favor until recently. Hipster men are more apt to have facial hair and a center part (no bangs) if they have long hair these days. 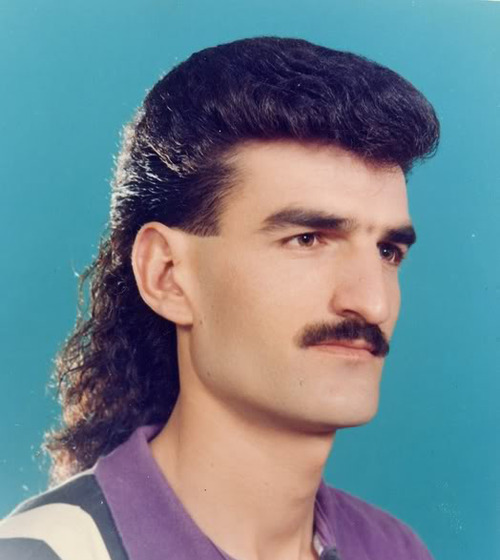 Bangs were pretty popular in the 60's and 70's but they were replaced by mullets in the 80's by men who liked to wear their bangs in the back. I think it's still considered bangs even if you sweep them to the side. I think the reason the layered hair for long haired men was popular wss because it kept hair out of your face to an extent, and ponytails might have been seen as too feminine at the time. Side-swept bangs are still bangs, as any stylist will tell you. Complete with the mustache, LOL!!! So, yeah, this is probably why you don't see guys wearing long hair and bangs.